HomeTagsPosts tagged with "after party"
Actress Selma Blair has made her first red carpet appearance prior to the Vanity Fair Oscars afterparty following her Multiple Sclerosis (MS) diagnosis. The 46-year-old actress wore a colourful green, pink, black and blue dress while carrying a custom embroidered cane to support her movement at the exclusive bash, and it brought her to tears. 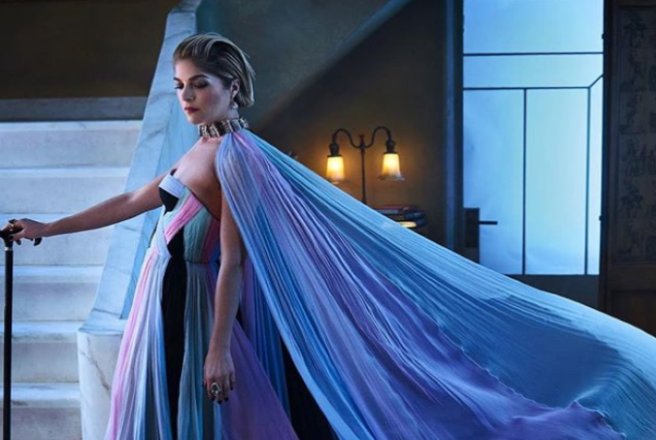 Best known for her performances in Hellboy, Cruel Intentions and Legally Blonde, she looked absolutely radiant while wearing an ethereal dress made by fashion house Ralph and Russo. The matching cape, choker necklace and black cane made her overall look truly stunning, but it was the emotion behind her cane that had audiences turning heads. She praised her friends for having created the stick for her. She shared a picture of her friend making the gorgeous cane on Instagram, writing: "This is love. How did I get so lucky?" "I wanted a special cane for Vanity Fair dinner. So… David Lyon went out and found patent leather and @bic_owen and he stitched it on. Hours of love put in. And then Tom Bachick made it especially magical. I burst into tears. These gifts to get me through. I can't thank these three enough. There are angels." The film star revealed on Instagram in October that she'd been diagnosed with the debilitating disease last August, but had been experiencing symptoms for 15 years prior. "I have MS and I am ok. But if you see me , dropping crap all over the street, feel free to help me pick it up. It takes a whole day for me alone. Thank you and may we all know good days amongst the challenges." She continued; "I am disabled. I fall sometimes. I drop things. My memory is foggy. And my left side is asking for directions from a broken gps. But we are doing it." I was in this wardrobe fitting two days ago. And I am in the deepest gratitude. So profound, it is, I have decided to share. The brilliant costumer #Allisaswanson not only designs the pieces #harperglass will wear on this new #Netflix show , but she carefully gets my legs in my pants, pulls my tops over my head, buttons my coats and offers her shoulder to steady myself. I have #multiplesclerosis . I am in an exacerbation. By the grace of the lord, and will power and the understanding producers at Netflix , I have a job. A wonderful job. I am disabled. I fall sometimes. I drop things. My memory is foggy. And my left side is asking for directions from a broken gps. But we are doing it . And I laugh and I don’t know exactly what I will do precisely but I will do my best. Since my diagnosis at ten thirty pm on The night of August 16, I have had love and support from my friends , especially @jaime_king @sarahmgellar @realfreddieprinze @tarasubkoff . My producers #noreenhalpern who assured me that everyone has something. #chrisregina #aaronmartin and every crew member… thank you. I am in the thick of it but I hope to give some hope to others. And even to myself. You can’t get help unless you ask. It can be overwhelming in the beginning. You want to sleep. You always want to sleep. So I don’t have answers. You see, I want to sleep. But I am a forthcoming person and I want my life to be full somehow. I want to play with my son again. I want to walk down the street and ride my horse. I have MS and I am ok. But if you see me , dropping crap all over the street, feel free to help me pick it up. It takes a whole day for me alone. Thank you and may we all know good days amongst the challenges. And the biggest thanks to @elizberkley who forced me to see her brother #drjasonberkley who gave me this diagnosis after finding lesions on that mri. I have had symptoms for years but was never taken seriously until I fell down in front of him trying to sort out what I thought was a pinched nerve. I have probably had this incurable disease for 15 years at least. And I am relieved to at least know. And share. my instagram family… you know who you are. MS can affect the brain and spinal cord, leading to problems with vision, muscle spasms and fatigue. The actress appeared visibly emotional last night as she made her way across the red carpet at the annual Vanity Fair soirée. "It took a lot to come out here," she said, as the photographers cheered her. "When my life flashes before my eyes, I want this portrait by Mark Seliger to be front and centre," the 46-year-old as the caption to the gorgeous image. Twitter fans have expressed huge admiration for Blair, for her raising vital awareness for MS in the entertainment industry. What a warrior, we love her lewk and that cane makes it even more special. Melissa McCarthy is genuinely one of the funniest women on the planet, and we love her even more (how is that possible?) after last night. The actress and her husband Ben Falcone opted to attend the Vanity Fair party after the ceremony in somewhat unconventional attire; Adidas tracksuits. The comedic pair were matching in their black outfits with white stripes, choosing comfort for the red carpet; "It's not less glamorous to me guys, I've doubled my diamonds – I feel great," the actress joked to Entertainment Tonight. McCarthy was nominated for the Best Actress category for her portrayal of Lee Israel in Can You Ever Forgive Me? but ultimately lost out to Olivia Colman, who gave a memorable speech when accepting for her performance as Queen Anne. He starred alongside his wife in Can You Ever Forgive Me? as well as Bridesmaids, Identity Thief and Tammy. His unsurprising response to Melissa's suggestio was; "150% yes, let's do this." Absolute heroes. 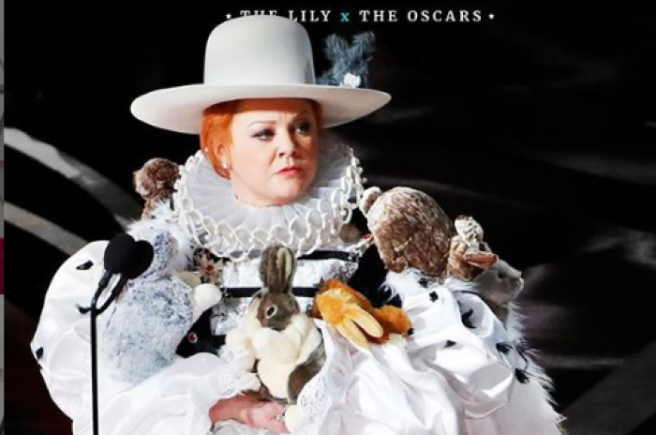 Despite losing out on the award of Best Actress, she presented the Best Costume design award hilariously impersonating both Margot Robbie's Queen Elizabeth and Olivia Colman's Queen Anne. The Favourite and Mary, Queen of Scots were a major part of her costume; she even had the numerous rabbits surrounding her, and ginger mess of hair. We're crying. Her and Ben are couple goals for life. Ruth E. Carter was handed the award for Black Panther and became the first black person to win the coveted prize, deservedly. Those Wakanda costumes will forever be inspiring. It seems like Kourtney Kardashian had a little too much fun at the Glamour Woman of the Year Awards last night. The reality star was all glitz while attending the fancy event – yet, the after-party saw her stripping down to nothing, and posing for a picture with only a fur blanket thrown over her. The reality star took to Snapchat to share the image with her fans. She simply captioned the pic: "After party." But, it's no wonder that the 37-year-old let her hair down as she was flying solo on this trip to London. She went without any of her children or her sisters, so we're sure the night was pretty much drama-free. Ladies of the moment, Kourtney Kardashian and Kylie Jenner have washed off a lot of bad press lately, but it seems the girls weren't thinking too much about it last night as they dazzled at the Golden Globes after-party. 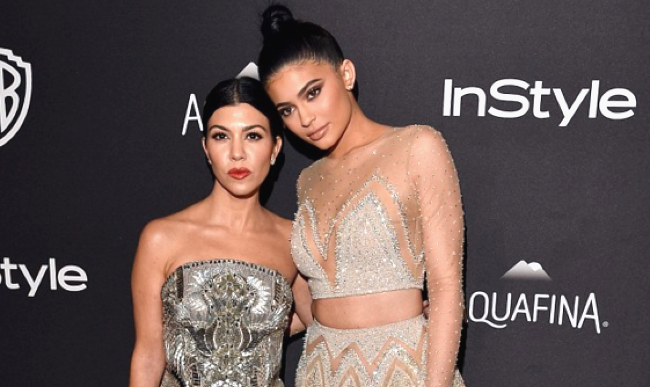 With boy drama coming from every angle – Kylie's boyfriend Tyga has been accused of cheating and Kourtney's ex, Scott has been pictured with another woman – the sisters put on a show in glittering dresses as they attended the InStyle and Warner Bros Golden Globe after-party bash. Kourtney showed off her toned figure in a Julian MacDonald dress and Kylie wore a princess-like two-piece. And of course the ladies weren't shy of the camera, posing for pictures with any chance they got. At the end of the night, it seems like Kourtney and Kylie had a ball, and let's hope they forgot about their man troubles for one night. 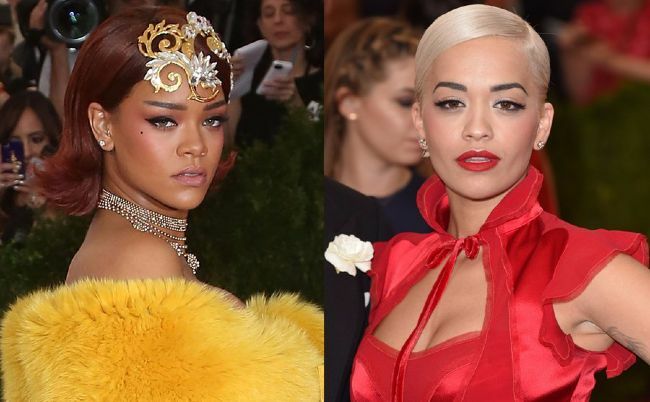 We had no idea about the feud between Rihanna and Rita Ora. Rihanna held a Met Gala after party at Up & Down nightclub in New York City on Monday following the Met Gala at the Metropolitan Museum of Art. 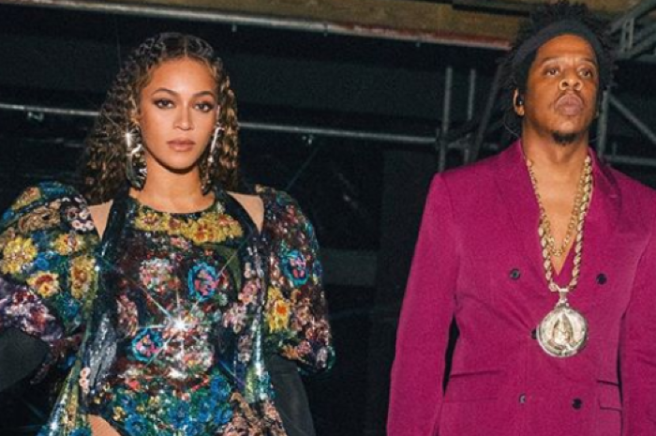 For some reason, the singer refused to give Rita Ora an invitation to the event, which was attended by celebrities such as Kylie Jenner and Justin Bieber. A source told the Sun: "She has a real issue with Rita and this was her chance for revenge." "She made it clear when organising her party that Rita was not to gatecrash under any circumstances," they added. The 27-year-old reportedly spent a lot of the night hanging out with Cara Delevingne, Rita's ex best friend which caused an awkward atmosphere between the 24-year-old and the model. A source said: "It was very icy between Rita and Cara. They spent the night trying to ignore each other. Rita decided to hang out with Miley Cyrus instead. She was never going to attend Rihanna's party because she'd made plans to go to another bash." Rita ended up at Lady Gaga's after party at the Diamond Horseshoe nightclub instead.